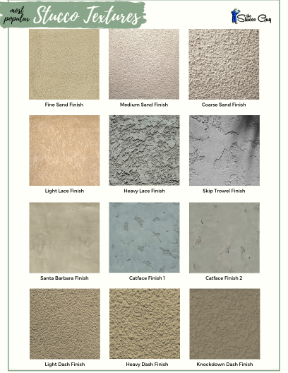 Stucco comes in many different shades and hues to compliment anyone’s personal style and can be customized to match any type of existing landscaping. Take a look at some of the various color charts below to get a better idea of what combinations you like and which ones you would prefer to stay away from. As you can see from the charts above, many of the colors are “earthy” tones that are somewhat neutral in hue. Check with different manufacturers, there will be slight color variations between the different ones. Here are some color combinations that other individuals have used on their houses, you can get a feel for what to expect and what you might like. Use your imagination and try different things in order to stand out from the crowd a bit. Yellow is a great color and can make a house look very unique and can even give it a particular style and presence that other colors might not be able to achieve. White is a common color that looks clean and more modern. It can come in a number of different shades and can be combined with any other color to have a marble look to it. Neutral colors are modern and earthy in appearance and give a house a subtle sense of elegance. They are minimalistic but give a certain aww value no matter where you live. Two-tone color combinations can give the house a more custom look and feel to it. It takes a little more time to do because the plasterer’s need to tape off edges and various other areas where the two colors meet, but is worth it in the end. This is a more uncommon color, but some people can pull it off quite nicely. Notice the different styles of architecture that make each one stand out from the next. Green has an alluring effect on most people and can be an earthy type of look. Many shades of green can also be somewhat of a neutral color choice that can be accented with other highlighting colors.